Intended for achieving examination success, this series replaces the former "GCSE Study Guides". 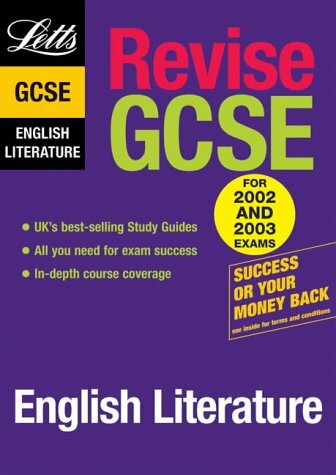 "Revise GCSE" offers complete study and reference support for the English Literature GCSE course as well as being a revision guide for English Literature GCSE examinations and Scottish Standard Grade. It provides a breakdown of the syllabuses and exam structure for every exam board, advice on studying, revising, coursework and exams, topic-by-topic coverage, clearly presented with many examples and diagrams, quick tests for every topic to check progress, and a bank of recent GCSE exam questions with answers to fine-tune exam techniques. If you have any questions about this product by Letts Educational, contact us by completing and submitting the form below. If you are looking for a specif part number, please include it with your message.